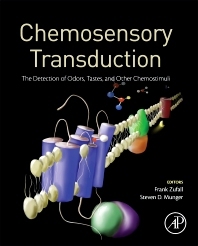 Written by leaders in the field of chemosensation, Chemosensory Transduction provides a comprehensive resource for understanding the molecular mechanisms that allow animals to detect their chemical world. The text focuses on mammals, but also includes several chapters on chemosensory transduction mechanisms in lower vertebrates and insects. This book examines transduction mechanisms in the olfactory, taste, and somatosensory (chemesthetic) systems as well as in a variety of internal sensors that are responsible for homeostatic regulation of the body. Chapters cover such topics as social odors in mammals, vertebrate and invertebrate olfactory receptors, peptide signaling in taste and gut nutrient sensing. Includes a foreword by preeminent olfactory scientist Stuart Firestein, Chair of Columbia University’s Department of Biological Sciences in New York, NY. Chemosensory Transduction describes state-of-the-art approaches and key findings related to the study of the chemical senses. Thus, it serves as the go-to reference for this subject for practicing scientists and students with backgrounds in sensory biology and/or neurobiology. The volume will also be valuable for industry researchers engaged in the design or testing of flavors, fragrances, foods and/or pharmaceuticals. Are Certain Types of Olfactory Ligands Specialized? Why Does the Gut Sense Nutrients? Dr. Frank Zufall is Professor of Physiology and Founding Director of the Center for Integrative Physiology and Molecular Medicine (CIPMM) at the University of Saarland School of Medicine in Homburg, Germany. He previously held an Assistant Professorship at Yale University, New Haven, and tenured faculty positions at the University of Maryland, Baltimore. He received a Diploma in Biology from the Freie Universität Berlin, a Ph.D. in Zoology from the Technische Universität München, and completed postdoctoral training in the Department of Neurobiology at Yale University School of Medicine. His research program focuses on understanding the organization and molecular basis of the sense of smell. Specifically, he investigates how social chemostimuli, such as pheromones and kairomones, are detected and transduced by sensory neurons and what the underlying neural circuits for odor-driven, innate behaviors are. He also investigates interactions between the immune and olfactory systems. Dr. Zufall has been recognized with a Takasago Research Award for the extensive contribution to the growth and knowledge in the field of olfactory science. He currently serves as an Associate Editor for the journal Chemical Senses. Dr. Steven D. Munger is Professor and Vice-Chair of Pharmacology and Therapeutics and Director of the Center for Smell and Taste at the University Florida. He previously held tenured faculty positions at the University of Maryland, Baltimore. He received a Bachelor of Arts in Biology from the University of Virginia and a Ph.D. in Neuroscience from the University of Florida, and completed postdoctoral training with the Howard Hughes Medical Institute and Johns Hopkins University. His research program focuses on the molecular basis of chemosensation in olfactory, taste, gastrointestinal and endocrine systems. Specifically, he investigates how diverse chemosensory receptors and transduction mechanisms contribute to chemosensory function, impact ingestive and social behaviors, and interact with hormonal systems that regulate metabolism and nutrient response. Dr. Munger has been recognized with the Presidential Early Career Award for Scientists and Engineers and the Ajinomoto Award for Young Investigators in Gustation. He is currently President-elect for the Association for Chemoreception Sciences.